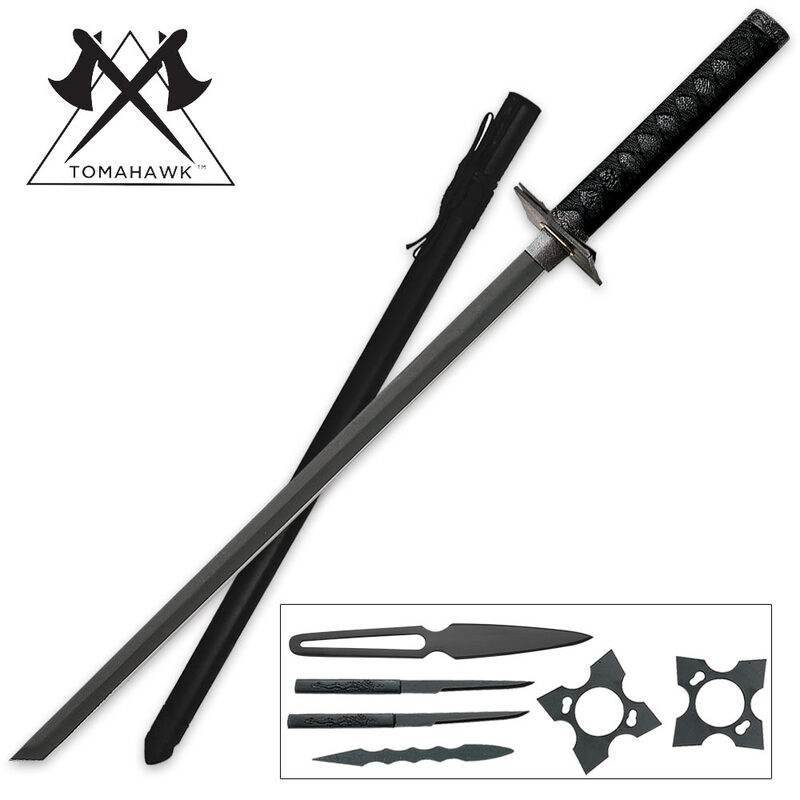 Black Ninja Sword Set | BUDK.com - Knives & Swords At The Lowest Prices! 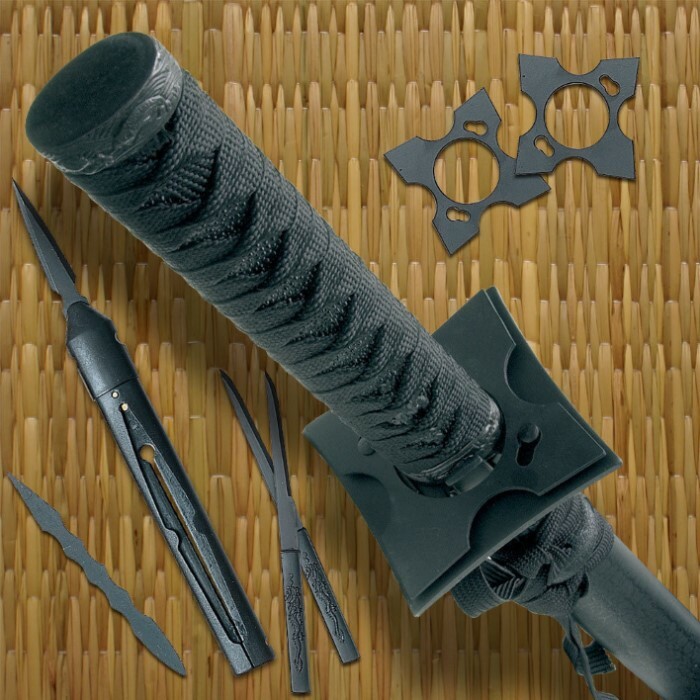 This ninja set features a ninjato sword with a 23" black-finished carbon steel blade. The cast metal handle offers a nylon cord wrapped hilt. The ninja set also offers 2-piece removable throwing stars, mini tanto, and throwing knives. Includes matching scabbard. This is for display only, and a crappy display piece at that. The sword itself has a quarter tang that is pinned to the handle, with a bolt tang spot-welded to it. If you hit anything with it that's remotely solid, this sword will break at that weld. Luckily the pin will help keep it from flying out of the handle. Speaking of the Handle, It's solid plastic, wrapped with the cheapest nylon cord available. The scabbard is a thin aluminum tube with plastic inserts. to house the various hidden weapons. The Throwing knife/dagger doubles as a spearhead that can be attached to the end of the scabbard, and is the sharpest blade in the set. The mini tantos bend SUPER easy. The yawara is fairly solid, and is probably the only thing that could actually be used as a weapon. The throwing stars are dull but will stick into soft wood targets. I would never purchase this again, but if you decide too just leave it on display. I bought this sword a while back and I noticed right away a couple of problems. The blade is very soft carbon steel and bends with almost no effort. It also sits uncomfortably in the hand as the handle is too large and the cord wrapping is rough. The small weapons it comes with are of fair quality but nothing to brag about. Scabbard is surprisingly not wood or plastic but metal. Not bad for a wall hanger but for all you zombie apocalypse types, look elsewhere this is not the sword for you, I personally suggest a machete instead of a sword. Hope it helps. This sword looks great but upon swinging it a couple times the sword bends like aluminum along with the throwing knives that come with it. It looks like the didn't Harden the metal. Not a bad sword but if you are in a combat situation, you will want something different. None of the weapons on this were meant for cutting. If you get this, expect to do machining in order to have the weapons fully functional. the sword looks great but once you actually try using it for anything the blade falters. i had taken maybe 7-8 swings with mine and the blade bent over 45 degrees near the tip.